I wasn't entirely sure what to expect from Bridesmaids before I saw it at the screening. The trailer made it look funny but raunchy, and I had been told that it was similar to The Hangover, but with women instead of men as the lead characters. It turned out to definitely be raunchy, albeit funny, but with a lot of surprisingly serious scenes thrown in as well. Annie (Kristen Wiig, TV's "Saturday Night Live") is best friends with recently engaged Lillian (Maya Rudolph, "Grownups"). Lillian asks Annie to be her maid of honor, and Annie accepts, not yet knowing how much work it will entail. The other bridesmaids that Lillian chooses could not be a more diverse group: there is her fiance's sister, Megan (Melissa McCarthy, TV's "Mike and Molly"); Rita (Wendi McLendon-Covey, TV's "Rules of Engagement") who hates being a wife and mother; Becca (Ellie Kemper, TV's "The Office") who is a newlywed herself; and Helen (Rose Byrne, "Insidious"), who is married and a stepmother to two kids that hate her, all the while looking like she's stepped out of a magazine. Annie is going through some life struggles at the moment as well - her cake shop has just gone under, and so she is working part-time at a jewelry store - and is having trouble accepting that her life is on the decline while her best friend is about to be "blissfully happy" for the rest of her life. The hilarious story that ensues is that of a woman trying to navigate the often competitive world of bridal showers, engagement and bachelorette parties, and the wedding itself, all the while having no clue what she is doing. There was definitely a lot of raunchy humor in this film, but overall it worked well. The supporting cast was great too, including Chris O'Dowd ("Gulliver's Travels") as a cop with whom Annie ends up spending time, and the late Jill Clayburgh ("Love and Other Drugs") as Annie's mother. Jon Hamm (TV's "Mad Men") also has sort of a cameo role as a "friend with benefits" to Annie, although she wants more from him and he definitely doesn't want to commit. It was fun to see him as the typical male jerk of the film: in one scene, he comes to pick up Annie when her clunker of a car dies, and cheerfully yells "Hey, f--kbuddy!" from the window of his sports car. I really liked O'Dowd's character (Officer Rhodes), and the chemistry between him and Wiig; he is sort of the anti-Jon Hamm of the movie, and someone that Annie desperately needs in her life. Yes, see this movie - just be forewarned that it's rated "R" for a reason. There were only a few "eww" moments in terms of "potty humor" and whatnot, but there's a lot of sexual content and profanity in it. If you are looking for a comedy that has a lot of heart, however, you will do well in seeing Bridesmaids. 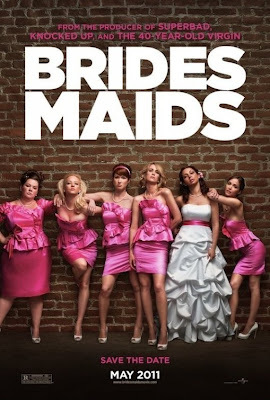 Bridesmaids is in theaters today, May 13th.